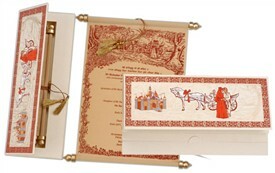 S718, White Color, Shimmery Finish Paper, Exclusive Invitations, Scroll Invitations, Jewish Invitations, Cinderella Wedding. 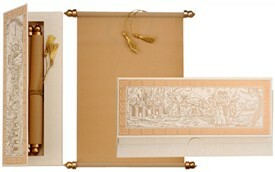 The mark of genuine grandeur, this box card is the niche’ design of the collection! 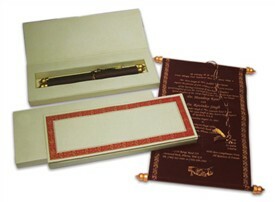 Minimal and classic in approach the design gives out a totally different outlook to wedding invitations. 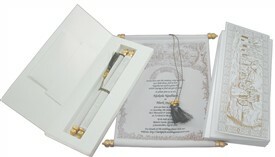 The scroll is in Ivory silk handmade paper with golden dowels and golden tassel to tie the rolled scroll. 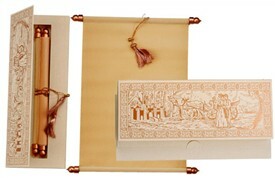 The scroll card is placed inside the container over a golden net and is encased in a beautifully designed hard cardboard box. A Golden ribbon ties the box. 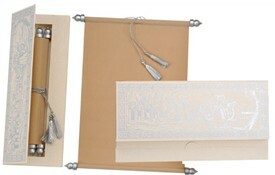 Ivory color silk handmade paper for cardboard box, mailing box envelope and scroll.